My life consists of work and dreaming. I work as a Sales Manager by day for a VW dealership. I live in the Western Suburbs of Johannesburg. I started dreaming of riding to destinations when I rode my Yamaha R1 to the local breakfast run spots every sunday. It was the same old run every weekend, fast but boring. I dreamt of owning BMW R1200GS and using it to travel where ever i wanted to. So it began. November 2009 i came across a red 2005 GS 1200 (28000km) standing on an empty showroom floor in Springs. I picked up immediately that it has been involved in a small accident some time ago but for some reason I was attracted to it. I decided to purchase it and so my journeys began. My good mate Tewie (my boss at the time) dropped me in Springs to collect. We started planning our first trip to Lesotho. 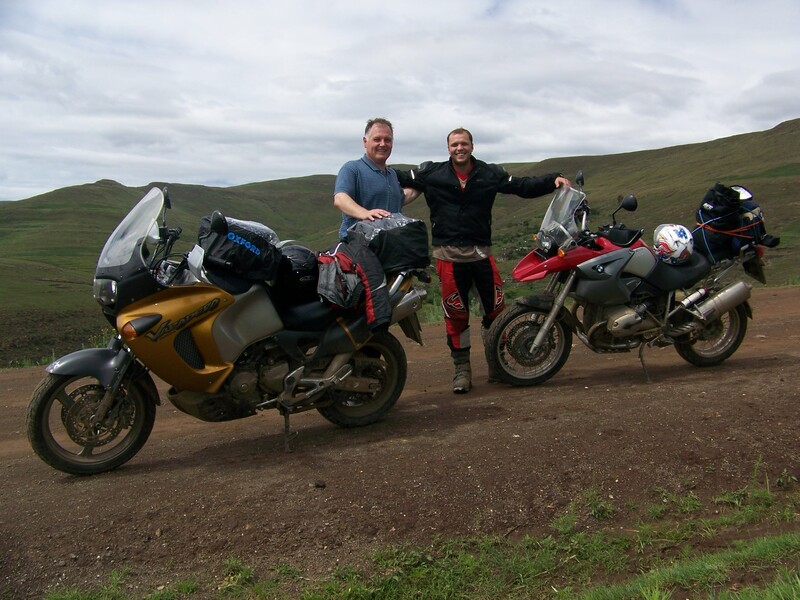 Lesotho was amazing and we found our love for adventure riding that weekend. Heavy rains, broken bike, bad gravel surfaces in a country that we couldn’t understand the language, is what we knew we wanted. I have in time travelled to Namibia, Botswana,Swaziland, Zimbabwe and Zambia all on 5-10 day trip. On a weekend somewhere in the beginning of 2012 I made a split second decision of planning my trip across Africa. Offcourse it was motivated by Long Way Down, Noord van Naboom and Riaan Manser’s bicycle trip around Africa but I have a longing to see Africa and realised my means of doing it. So planning has started, I have a rough idea to depart sometime in 2013 and the infamous travellers blog is now up and running. Tewie and I on our first trip to Lesotho.